Have you ever seen a salad so beautiful? Oh I just love everything about it. 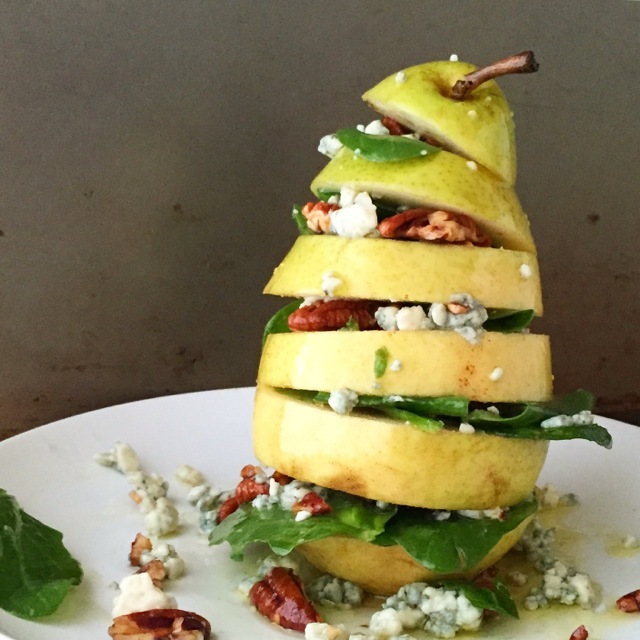 The pear goes so well with the maple-syrup vinaigrette, blue cheese and candied pecans. And the presentation, oh the presentation! 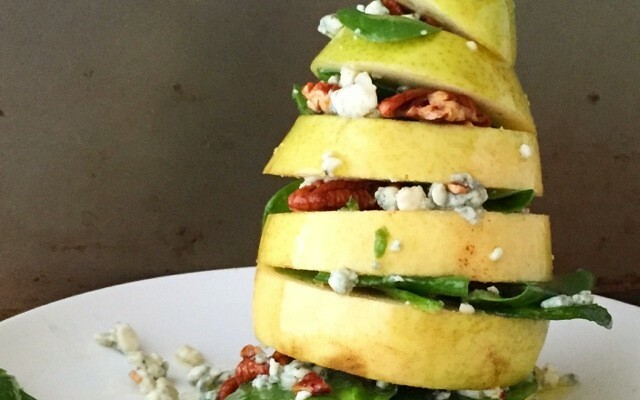 You can serve this salad vertically or horizontally. And while serving it vertically makes for a truly stunning presentation, be careful because it’s hard to keep it standing! So on a day-to-day basis, I serve this salad “caprese style,” with the pear and spinach alternating like tomato and mozzarella. In a medium bowl, dress the spinach and mix it with a little of the cheese and pecans. Then slide a little of that goodness in between each slice of pear. The recipe makes plenty of dressing, but you may not use it all . . . depending how big or small your pears are, and how much dressing you like. Garnish with remaining cheese and pecans. And if you like it sweet (like I do! ), drizzle with a little remaining maple syrup on top and serve! Hope you enjoy! The full recipe is available here.